This year in March ESI announced the launch of MaXiO XD. MaXiO stands for maximal input/output solution. XD means Extended Edition, as there is a half-rack stereo modification MaXiO 032. 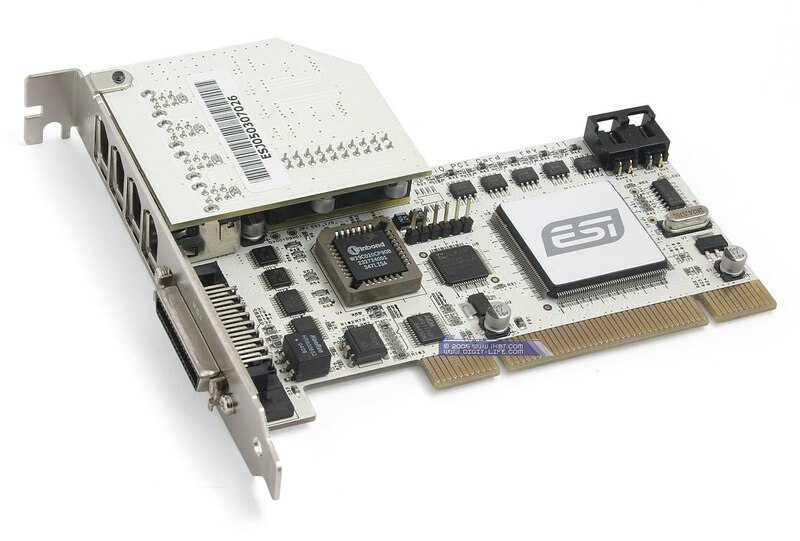 The new product is a set of 2U-rack space unit EX8000 and a PCI host card. Interestingly, the module can operate in autonomous mode as well. 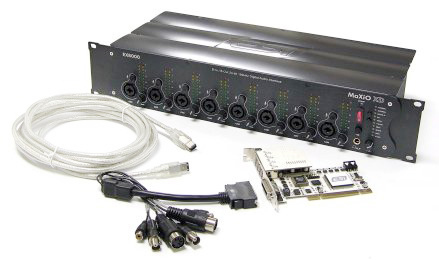 EX8000 key features: eight mic inputs that can also work as linear inputs, and top DAC and ADC. The light version, MaXiO 032, also possesses top converters. Any MaXiO is an expandable solution. 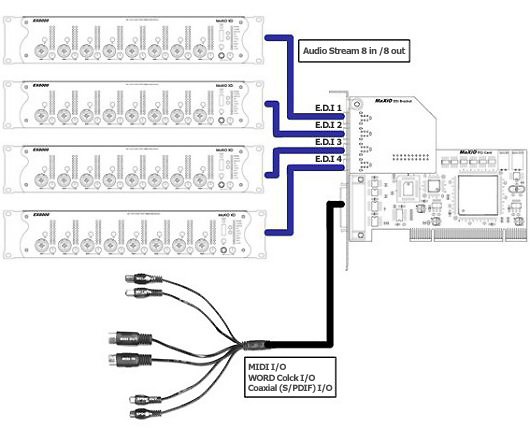 As is shown on the diagram, up to four EX8000 rack modules can be connected to the host card; the multi-pin connector is for an adapter to digital/MIDI connectors, or for a MaXiO 032 module. The device offers operating modes up to 24 bit 192 kHz. Converters are located only in the rack unit. Available interfaces are shown below. 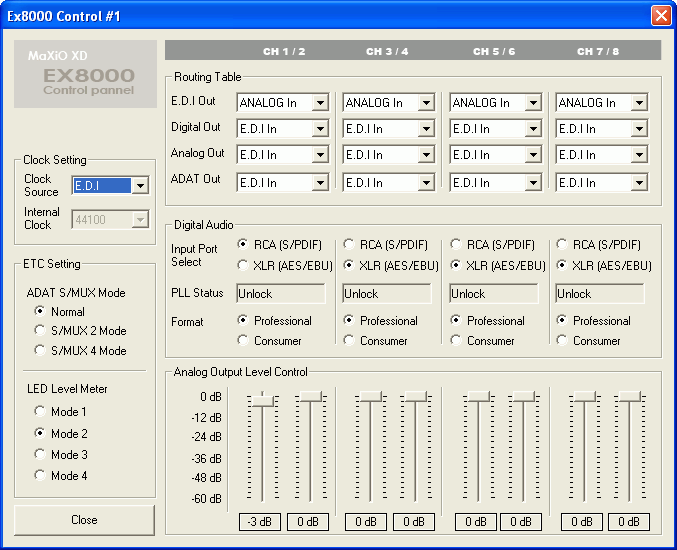 A great advantage of MaXiO XD is its hardware control over the input signal level of each channel. It's actually a rack digital mixer. The control panel is implemented in a traditional ESI style - maximum settings on a single screen. Advantage : all the main options are available there. Disadvantage: too many settings in this multifunctional device that allows up to 4 rack units plus additional interfaces. 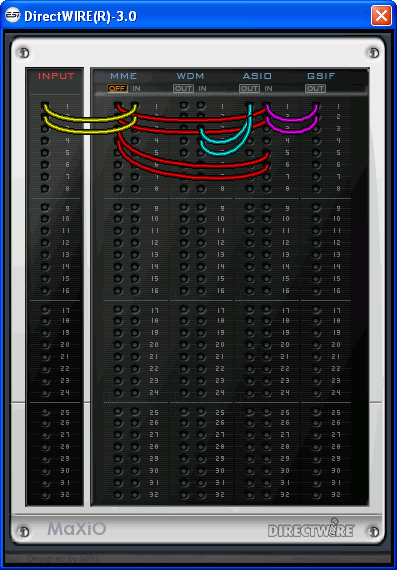 Internal routing of rack units and interaction modes with the host card are configured in a separate window. Signal routing has practically no limitations! At the same time, the settings are too intricate. Reading the manual (available only in English) and analyzing sample configurations are not of much help. We'd like to see more descriptive routing diagrams using graphical Windows tools in future drivers. Devices of this price level must have intuitive settings. Here is an example of good visual routing - DirectWire3 panel, MaXiO bundle. We took the measurements in loopback mode. 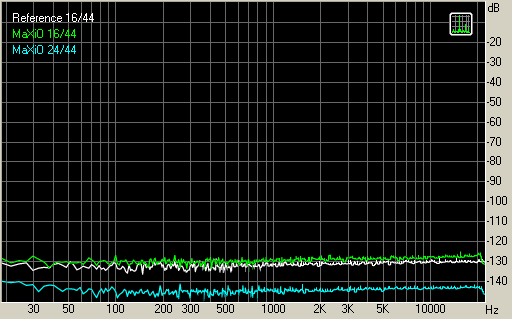 Detailed report on testing in 16 bit 44 kHz mode. 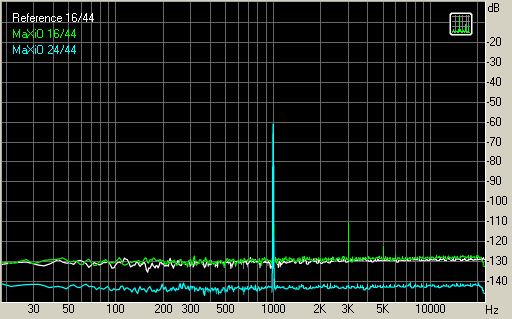 Detailed report on testing in 24 bit 44 kHz mode. An external top-class device, even if connected to PC, allows a rack unit to use an independent power supply that filters noise and pickups. It has an immediate effect on the quality of a generated signal. 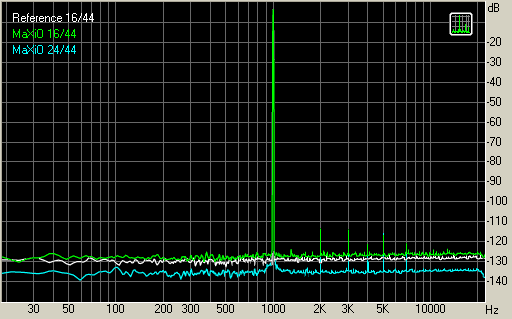 The noise spectrum lacks any signs of artefacts! 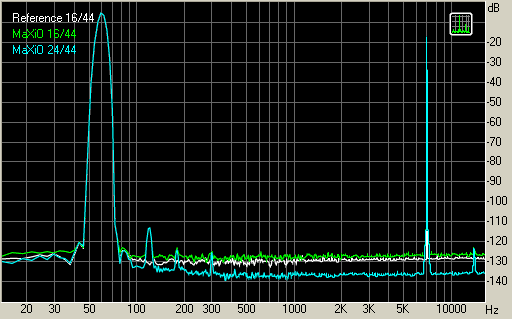 Even having passed through DAC and ADC, the noise spectrum practically reaches the theoretically possible limit for a 16-bit signal. If we had tested input and output separately, we would have got a higher result, mind it. It's not self-noise in the lack of a signal - in our test we apply a real signal of a minimal level, but containing only dithering noise. 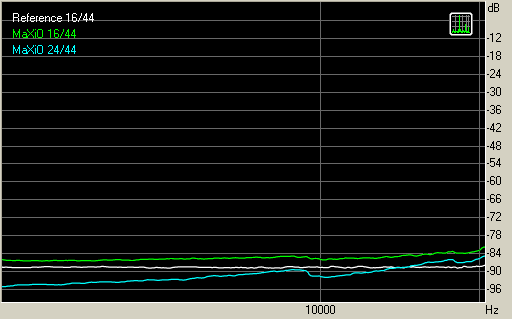 Dynamic range tests show that we'd better use this device in 24 bit mode, even if the final result is planned in 16 bit. Non-record-breaking overall results can be probably explained by AKM4395 DAC, while devices of this class usually use CS4398. That may also be an effect of combined linear and mic inputs. Nevertheless, MaXiO requires top-class devices to reach the potential level of such high results as 110 dB dynamic range. You should always keep in mind that the resulting quality is determined by the worst device in a circuit. The price looks very competitive. To test how the device works in practice, we recorded a vocal session. We used CubaseSX3 sequencer, Shure Beta 58A mic. A professional vocalist was invited for our test project. We had no problems or gripes with MaXiO. What concerns drawbacks, we should mention the entangled control panel. We understand that such devices need thorough practical testing. In future we'll solve all our organizational problems and will use a wider range of microphones, test-recordings of various sources, and will publish final results for our readers.